Season Eleven ran from December 15, 1973 to June 8, 1974. It contained 26 episodes across five stories. This year ended Jon Pertwee's run as The Doctor, and started Elisabeth Sladen's run as companion Sarah Jane Smith. Sarah Jane is the third of the four iconic Classic Who companions. She was around for 3 1/2 seasons and is generally considered to be the best companion of the entire classic show. While she is quite good in this season, she doesn't really come into her prime until Tom Baker became the Doctor and Four became Sarah Jane's best friend. This season is kind of the least Pertwee of his era. Unit doesn't do a whole lot in most of the stories, Jo has left, the Doctor is free to roam over all of time and space, and we won't see the Master again for several more years. It was a good way to transition in to a new Doctor who would be more used to traveling around. That being said, this season also has the one story that I would call "the most Pertwee of the Pertwee stories" as it includes almost everything from the Pertwee Era checklist. The first story is The Time Warrior and it's four episodes long. A Sontaran warrior by the name of Linx has crash landed on Earth in the Middle ages. He claims Earth for the Sontaran Empire and begins to repair his ship. A local bandit, Irongron, strikes an alliance with Linx in exchange for "magic weapons." Linx realizes the technology of the time is too primitive so he begins stealing scientists from the future and hypnotizing them to assist in repairing his ship. The Doctor and Unit investigate the disappearances where they run in a young journalist named Sarah Jane Smith. Later that evening, one of the scientists UNIT was keeping tabs on disappears and the Doctor uses the data gathered to fly the TARDIS to where the kidnapping transmission is coming from. However, the Doctor has not realized that Sarah Jane has stowed away. Sarah Jane is captured by Irongron but is rescued by a bowman from a nearby castle who was sent to kill Irongron. Eventually the Doctor infiltrates Irongron's castle with help from Sarah Jane and finds the missing scientists. Using Linx's technology he sends the scientists back to the 20th century but gets caught by Linx in the process. One scientist, however, hits Linx on the only weak spot of his body knocking him out. The Doctor sends the last scientist to his regular time and both the Doctor and Sarah Jane escape. Linx awakens and attempts to leave in his spaceship but an archer strikes Linx down. Linx lands on the self destruct mechanism and the whole castle blows. Although this may not sound like much, this is my favorite Pertwee story. I'm not even really sure why it's my favorite, it's just one that I can watch over and over and never tire of. This may be partly due to the increased amount of humor in this script. There is quite a lot of banter between Linx and Irongron, not to mention that the Doctor keeps away Irongron's forces with scarecrows and stink bombs. The sontarans are a great addition to the villains roster and Linx is the best looking one in the classic show. Unfortunately, the Sontarans would keep getting worse and worse looking as the years go by until their return in the new show. 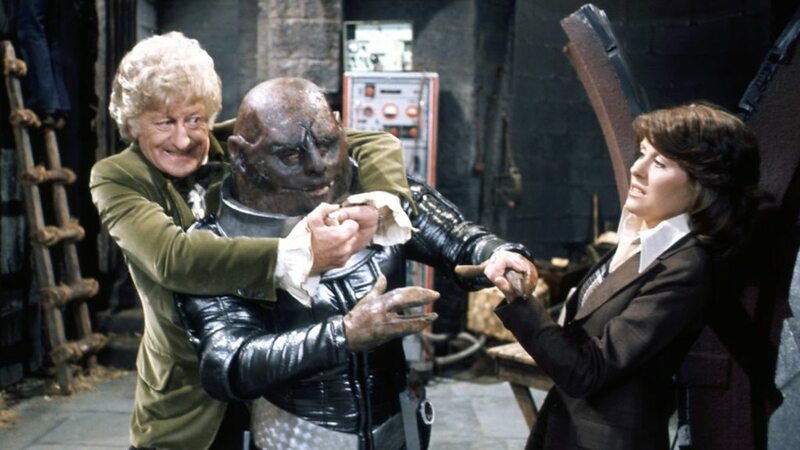 Interesting side note - the word sontaran was supposed to be pronounces "son-tur-ON" but the actor playing Linx was Austrialian and therefore pronounced it "son-TAR-an." His logic was that he was a sontaran so he should know how the race is pronounced. The next story is Invasion of the Dinosaurs and it's six episodes long. The Doctor attempts to take Sarah Jane straight back to London after their stint in the middle ages only to find that London has been deserted for the past few weeks. While there, they are accidentally imprisoned as looters, but discover that London was evacuated due to the random appearance and disappearance of dinosaurs. The Doctor recognizes these events and theorizes that someone is deliberately tampering with time. The Doctor and Sarah Jane are picked up by the Brigadier as Captain Yates is seen coming back from leave. 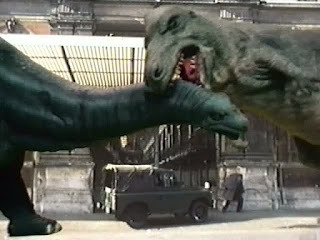 Yates has joined a group of scientists who are using the dinosaurs to scare away people from London. Their goal is to transport their followers back in time to re-build society fresh from pollution. Eventually the Doctor is framed for the dinosaur appearances and Sarah Jane is captured and awakens on a space ship with other people who believe they are traveling to a new planet. After some investigating of her own Sarah Jane finds out that the people are actually hidden in a basement near the time scoop technology. The Doctor and the Brigadier avoid the military and dinosaurs to find the people in charge. Fortunately, the Doctor sabotages the time scoop and when it's activated, it only sends the man who pulled the trigger into the past. Yates is allowed an extended sick leave to resign quitely as the Doctor decides to take Sarah Jane on a vacation. Invasion of the Dinosaurs is the most Pertwee of Pertwee stories - It's earthbound, UNIT is heavily involved, the Doctor drives a fancy vehicle at one point, The Doctor dresses the most elaborate he ever has in this version, and the monster effects are absolutely terrible. I'm not joking about the dinosaurs here; even the production crew to this day make fun of the terrible special effects in this story. It's not a bad story whatsoever so check it out if you can handle incredibly cheap and bad looking dinosaurs. It was also weird to see one of the normal cast from the UNIT family betraying the rest of the group. One final thing to note is that episode 1 was missing. 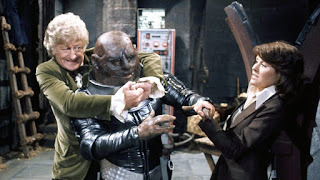 While they colorized all the other Pertwee episodes that were missing, for the DVD release of this story, they didn't. The colorized version is added as a special feature on the disc for some reason, but when playing the whole story at once, the first episode is black and white. The next story is Death to the Daleks and it's four episodes long. While traveling through space, the TARDIS suffers an energy drain and crashes on the planet of Exxilon. Sarah Jane and the Doctor get separated with the local inhabitants attack. The Doctor is eventually picked up by some space marines who also crashed on the planet from the same circumstances. They were on a mission to Exxilon to find an ore only common on that planet which can cure a deadly space plague. 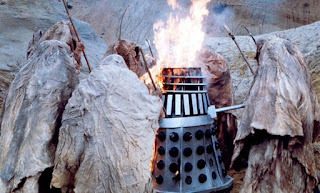 Sarah Jane, however, finds a white city with a beacon and is captured and set to be sacrificed for approaching holy ground. Things become stranger when the Daleks land on Exxilon as well claiming to have the same goal as the Space Marines, however the energy drain has also affected the Daleks. The Marines and the Daleks work together to fix the energy drain problem, at least until the Daleks improvise by substituting their regular energy weapon with a machine gun and have the locals turn on the marines. The Doctor rescues Sarah Jane and with the help of a friendly local head towards the white city which is the source of the energy drain. The Doctor puts is puzzle solving skills to the test as he slowly goes through the labyrinth of passages and tests within the building to finally reach the central computer to shut it down. At the same time Sarah Jane climbs to the top of the beacon to plant a bomb. Both the Doctor and Sarah Jane succeed in their endeavor as one of the marines detonates the bomb he planted on the Dalek ship. This is a weird one for many reasons. It's one of the more unique stories to have the Daleks in it. Generally Dalek stories have this same sort of feel with them just wanting to exterminate everything, however this one put the Daleks out of their comfort zone. It was also refreshing but strange to see the Third Doctor spend the majority of an episode just solving puzzles to move forward in the maze. That wasn't something you saw often in Doctor Who at all, but it certainly wasn't something you saw from a Pertwee Era story. If space Indiana Jones with Daleks sounds good to you then check it out! The next story is The Monster of Peladon and it's six episodes long. It's been fifty years since the events of The Curse of Peladon had transpired. 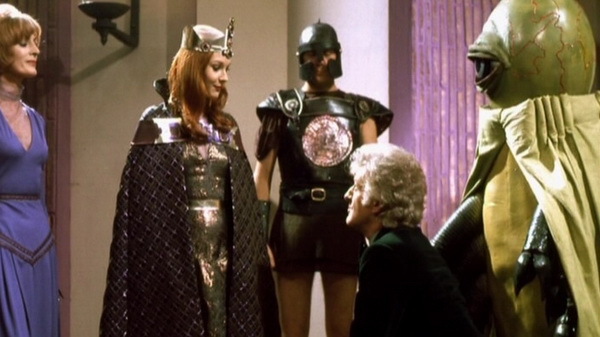 The King of Peladon is dead and his daughter has taken over the throne while being a full member of the Galactic Federation. Currently there is a power struggle between the miners who believe they are being treated unfairly, and the ruling class. When a ghostly vision of the royal beast Aggedor appears and kills minors everything devolves into madness. When the TARDIS lands, the queen enlists the Doctor to help track down the source of these visions. Eventually the miners steal a laser and intend to blow up the palace. When this happens the Ice Warrior delegates institute martial law on the planet. After some snooping, the Doctor finds out that the Ice Warriors have been projecting the image of Aggedor and killing the minors. The minors then turn their attention to the Ice Warriors and defeat them bringing peace back to Peladon. There's...not really much to say here. For a six-part story that I had little to say about, it honestly didn't have that many parts that dragged. It was just sort of a slower paced story overall and utilized it's time wisely. It's not a bad episode but there's nothing that fantastic about it either. If you liked the Curse of Peladon or if you like the idea of Star Trek Deep Space Nine done in 70's British style then you should like this well enough. Also, this is the last appearance of the Ice Warriors in the classic show. We won't see them again until New Who season 7! The last story of Season Eleven is Planet of the Spiders and it's six episodes long. After resigning from UNIT, Mike Yates contacts Sarah Jane about some strange happenings at a Buddhist monastery he was staying at. A man living there named Lupton and his group of cronies have been trying to summon something in the basement. 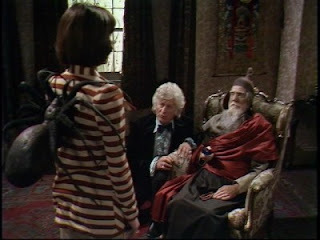 Sarah Jane and Mike witness the group's changing and a giant spider appears in the circle. The spider jumps on Lupton's back and disappears. Projecting it's thoughts into Lupton's mind, the spider informs him to find a blue crystal. Back at UNIT HQ, the Doctor receives a package from Jo sending back the blue crystal from Metebelis Three to him. Lupton arrives and steals the crystal resulting in a multi-vehicle chase with the Doctor. Eventually Lupton escapes but the crystal is taken by Tommy, a special needs man at the monastery whose mind is opened fully by the effects of the crystal. Lupton is eventually transported to Metebelis Three as his spider wishes to sabotage the other spiders now ruling that world. Unfortunately Sarah Jane is accidentally brought along as well and is captured. The Doctor makes his way to Metebelis Three to track down Lupton and find Sarah Jane. Finding his way to a large cave, he meets The Great One, a gigantic spider who rules the planet. The Great One is looking for the crystal that the Doctor had taken before and sends him back to Earth to retrieve it. He does so and takes Sarah Jane with him. Tommy takes the crystal to the monastery's abbot as the Doctor and Sarah Jane arrive to find the crystal. The abbot is actually an old Time Lord and friend of the Doctor. As the abbot begins to die (and regenerate) he tells the Doctor to return the crystal to Metebelis Three since he started the events that took place. The Doctor leaves Sarah Jane behind and returns the crystal to The Great One. She adds it to her collection but the overall psychic energy was too much and it destroys all the spiders on the planet while also flooding the cave with deadly radiation. Three weeks on earth later, the TARDIS re-materializes and the Doctor falls to the ground. The newly regenerated abbot projects his mind to the Doctor's friends at UNIT to explain that the Doctor is simply about to regenerate. There on the floor, the Third Doctor fades away into a new face. Planet of the Spiders is one of the few that a lot of people really enjoy but I don't particularly care for too much. The character of Tommy was a real treat, and having the abbot be a Time Lord was good but that doesn't really make up for the fact that the plot (though I made it sound straightforward) was just all over the place. Half the time I wasn't sure what was actually going on, nor did I know exactly what killed the Third Doctor. I've also heard people say that the Third Doctor went out "doing the right thing" by fixing a mistake he had made in the past by taking that crystal but... I personally never understood it that way. Maybe I'm just missing something or the meaning was lost in the confusion. Either way, this isn't one I can recommend too highly even though it is an important episode for the Doctor. Thus ends Season Eleven. I'm not really quite sure what to say about it. It just sort of exists. While The Time Warrior is my favorite Pertwee episodes, the rest of them aren't really that bad but aren't really that good either. It's all just sort of doable I suppose. With this season we say goodbye to the Third Doctor. I know this may sound harsh but while there was a part of me that loves the Third Doctor, there was a part of me that was glad to see him go. His era was the hardest for me to get through; not because his stories were bad, but more that his whole era was just a bit samey. Pertwee's era can basically be lumped into two categories. The larger category being Earth-bound where the Doctor does the same old schitck, and the smaller category being space-bound, weird, and not that great. Also, I generally believe that a 4-part story is the perfect length for any Doctor Who story unless you have something big and unique. The majority of Pertwee's era had a large amount of six-part stories which is just far too long. There's a lot of filler and a lot of dragging when you do a six-part story. It's because of these numerous dragging six-part episodes that I took forever to finish his era. Humorously enough I also took forever to write about his era on the blog. I don't want to be down on Pertwee or the Third Doctor whatsoever. 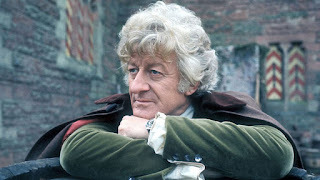 Pertwee was a wonderful actor and he made for a charming Doctor. He just wasn't as much my cup of tea. We do get to see the Third Doctor one more time in the Fifth Doctor's era, so at least we'll get to see the old action hero once more! Please join me again as we continue to examine all of Doctor Who.